Today I wanted to bring home a fun post and tutorial that I shared last spring over at Crafting Con. If you aren't familiar with Crafting Con check out a few other posts I have done like my Mini Effie look or our Mario T-Shirt Tutorial. This top is a little gem inspired by Candyland the board game. I love how it turned out and really wanted to share it during last May. 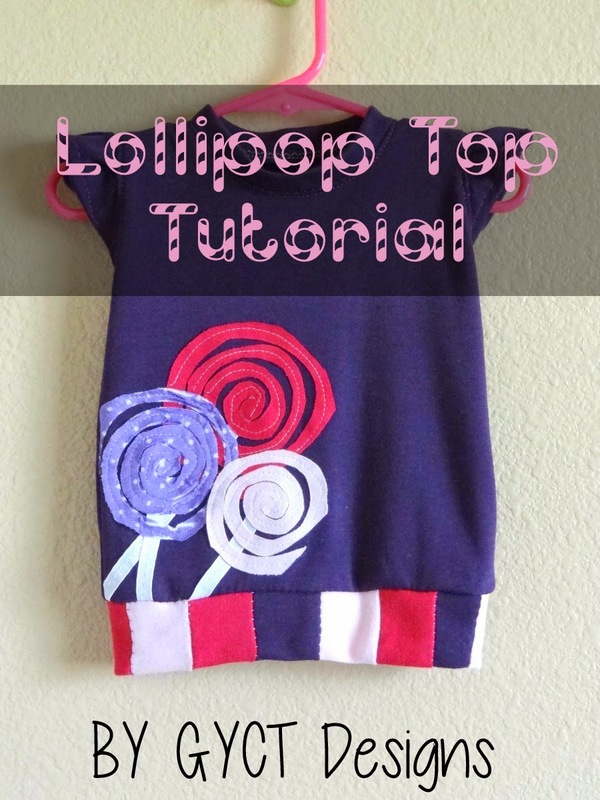 It is a really simple top but perfect for your candy loving kiddo. First we need to make the band for the bottom of the shirt. Cut your knit fabric scraps into strips that are about 2.5" wide and 4-5" long. (You may want wider or longer for larger sizes.) Stitch them together in a row. You'll want your row to be as wide as the bottom of your t-shirt. Then fold the two ends of the row together and stitch, making a circle. To make your lollipops, cut out circles from your Wonder Under. You'll want 3 different size circles, large, medium and small. Make a swirl pattern on each circle and iron them onto the wrong side of your fabric. Finally, take your scissors and cut out each circle. Once you've cut out your circles, use your scissors to cut around your swirl. Then carefully pull off the paper part of the Wonder Under. Take the front of your t-shirt, cut a piece of ribbon for the lollipop stick and pin it where you'd like your lollipop to be. Then place your lollipop swirl over the stick making sure to leave space between each swirl. Repeat with other lollipops. Once you have the placement you want, press the lollipops so the Wonder Under sticks to the fabric. Stitch down each of your lollipop sticks and swirls. Since you are using knit fabric, the raw edge will curl a bit after sewing and washing, but it won't fray. Now, if you are making a homemade t-shirt you'll want to finish sewing up your shirt but don't finish the bottom hem yet. Finally, take you band from Step 1, fold it wrong sides together. With right sides together, pin your band to the bottom of your t-shirt. Stitch it in place. Now press and you have your very own Lollipop Top. Perfect for all this wonderful spring weather!! Thanks for having me again ladies!! !